One of the members of a recent Hamas delegation to Russia was Muhammad Sawalha, a London-based Hamas operative engaged in extensive anti-Israel activities. Hamas delegation meets with Russian Deputy Foreign Minister Mikhail Bogdanov (Hamas website, September 21, 2017). The members of the Hamas delegation are sitting on the right. Hamas made their names public. They are [as identified by the ITIC] (right to left) Sami Khater, Husam Badran, Musa Abu Marzouq (center), Muhammad Sawalha (red box) Saleh al-'Arouri and the Hamas representative in Russia (unnamed). Muhammad Kazem Sawalha is a senior Hamas operative based in London who has held military and political positions in Hamas. At the end of the nineteen eighties he was a senior operative in Hamas military-terrorist infrastructure in Judea and Samaria. The infrastructure was exposed by the Israeli security forces. Sawalha, who was put on Israel’s wanted list, fled to Jordan with forged identity papers (October 1990) and from there went to Britain. In London he conducted extensive activities against Israel while also a member of Hamas’ political bureau (2013-2017). Muhammad Sawalha assimilated well into Britain’s Muslim community, especially among members of the Muslim Brotherhood (Hamas’ parent movement). He and other Hamas- and Muslim Brotherhood-affiliated activists found a refuge in Britain. He played an important role in turning Britain into Europe’s center for the campaign to delegitimize Israel. At the same time he contributed to inculcating the Muslim community in Britain with the radical Muslim ideology of Hamas and the Muslim Brotherhood. So far, Muhammad Sawalha and other Hamas operatives who fled to Britain have been careful not to publicly admit to Hamas affiliation in order not to get into trouble with the British authorities. However, Hamas recently publicly announced that a delegation, which included members of its previous political bureau, visited Russia (September 19, 2017). The delegation was headed by Musa Abu Marzouq (who until recently was deputy head of Hamas’ political bureau). One of the members of the delegation was Muhammad Sawalha, a member of the previous political bureau (2013-2017). The Hamas website and the Arabic media published pictures of Sawalha and the other members of the Hamas delegation meeting with Mikhail Bogdanov, deputy Russian foreign minister (Hamas website, September 21, 2017). 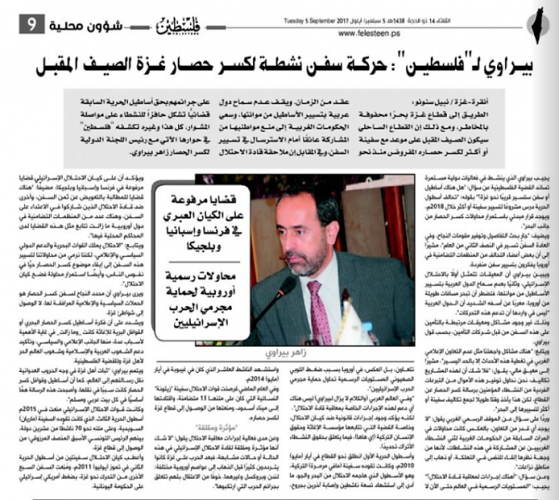 It was not the first time Sawalha was identified in the British, Arabic and Israeli media as a senior Hamas figure. For example, Muhammad Jumaa’, a researcher in the Al-Ahram Center for Political and Strategic Studies, wrote about the rise in Sawalha’s position in Hamas and his election to the political bureau in April 2013. He wrote that Muhammad Sawalha belonged to Khaled Mashaal’s camp and was responsible for Hamas’ international relations. He also wrote Sawalha had close relations with senior Muslim Brotherhood figures (Shuruq News, April 28, 2014). 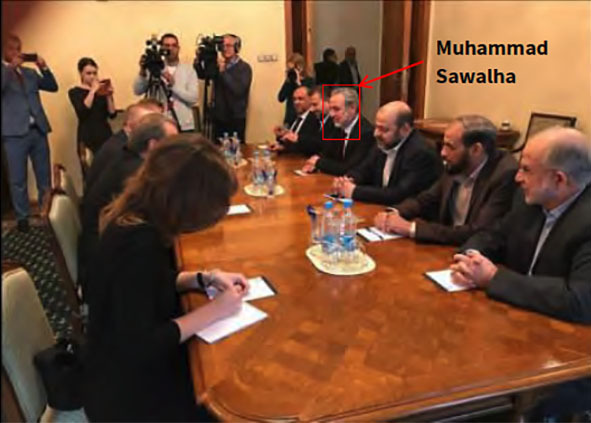 However, the difference between past and present reports is that this time it was the Hamas website that reported Sawalha’s participation in the visit to Moscow along with other members of the political bureau, publishing pictures. Hamas delegation meets with Russian Deputy Foreign Minister Mikhail Bogdanov (Hamas website, September 21, 2017). The members of the Hamas delegation are sitting on the right. Hamas made their names public. They are [as identified by the ITIC] (right to left) Sami Khater, Husam Badran, Musa Abu Marzouq (center), Muhammad Sawalha (red box) Saleh al-‘Arouri and the Hamas representative in Russia (unnamed). 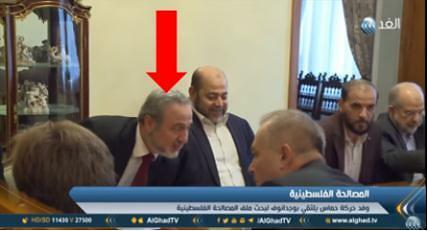 Muhammad Sawalha (red arrow, next to Musa Abu Marzouq) at a meeting of a Hamas delegation and Deputy Foreign Minister Mikhail Bogdanov (al-Ghad YouTube channel, September 19, 2017). So far the British authorities have not prevented Muhammad Sawalha’s extensive activities in London with other activists affiliated with Hamas and the Muslim Brotherhood. 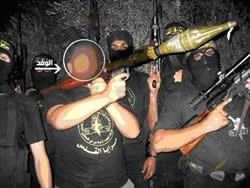 Those activities include involvement in transferring money from the United States to Hamas operatives in Judea and Samaria (during the first half of the nineteen nineties); initiating and participation in flotillas and convoys to the Gaza Strip (in collaboration with radical British anti-Israel activists and organizations); establishing and running Muslim Brotherhood front organizations spreading radical Islamist ideology to local Muslim communities; and participating in anti-Israel propaganda activities in London. All of the above are carried out with activists affiliated with Hamas and the Muslim Brotherhood who found a refuge in London, the most prominent of whom is Zaher Birawi. Now, following the formal identification of Sawalha as a senior figure in the Hamas leadership, only time will tell if the British authorities will continue to allow him to operate in Britain (alongside other Hamas and Muslim Brotherhood activists), or if they take steps to bring his activities to an end. Appendix A – Visit of a Hamas delegation to Russia. Appendix B – Portrait of Muhammad Sawalha and milestones in his activities in Judea, Samaria and Britain. The Viva Palestina convoy arrived in the Gaza Strip and was given festive ceremonies by senior Hamas and Palestinian Islamic Jihad figures. A Hamas-affiliated Palestinian in Britain admitted the flotilla project to the Gaza Strip was not intended to “break the siege” and bring humanitarian aid, but rather to promote the battle for hearts and minds against Israel.